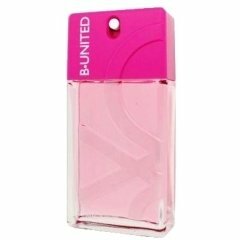 B.United Woman is a perfume by Benetton for women and was released in 2004. The scent is sweet-fruity. It is still in production. This is a luscious fruity oriental bordering on the gourmand side. The top notes are filled with gorgeous red berries and thick black currant essence. The heart and dry down is the most oriental phase. I smell well-blended flowers, cedar, powdery sandalwood, and vanilla all brightened by a zesty note of raspberry. It almost feels like I’m eating an exotic warm dish with a delicious scoop of raspberry sauce on top! I see this as a great summer time fragrance as well as a cozy and yet fun pick-me up fume for colder days. The dry down is SO reminiscent of Black XS! For lovers of Black XS, you could wear B United in warmer weather and rock the other one out at night! For lovers of berry/vanilla combos, at this low price, you owe it to yourself to try this one out! Ps: B United was created by one of my favorite noses, Christophe Raynaud, who also created the legendary powdery/berry fragrance "MY INSOLENCE" for Guerlain! You can definitely sense his signature silky style in this composition as well. Write the first Review for B.United Woman!